It was a cold, grey day in November. We huddled in our coats as we scuttled past the empty loading bays of an industrial area. Two men smoking outside the entrance to a seedy pool hall stared at us with open suspicion as we searched for a sign we were in the right place. The VR lounge was hard to find, but we eventually found the entrance nested within a cluster of Chinese businesses. It was beside an extraordinarily picturesque reflexology foot spa filled with intricate wooden carvings and an actual Buddhist temple that had been miniaturized to fit in the space. The soothing sound of running water faded away quickly as we were ushered into a den of gaming iniquity. I was immediately reminded of the Internet cafés I used to frequent in the 90s. Except that nobody in here was checking email. It was grimy, dark, and reminiscent of one of those sci-fi movies where the protagonist stumbles into a room of bodies hooked into the matrix or the inception dream world or whatever. We shelled out some serious dough for a one-hour VR session. We were shown to some empty cubicles in the back, with nothing but HTC Vive headsets hanging down by their umbilicals from the ceiling. A taciturn attendant briskly strapped on the headset and placed the controllers in my hands. Another helped my wife get set up. I heard him ask, “We doing the tutorial?” The other guy answered: “Yep”. Then he said “Look to your right” and just like that, I was floating in a white room with a droid walking me through the mechanics of virtual reality. I can’t believe six months have flown by since my last post. I’ve experienced some shame over this state of affairs, I’ll admit. But beneath the shame lies… ambivalence. And lack of time, I suppose. A flimsy excuse, I know, as I could make more time to tap away on my beautiful underused MacBook Pro instead of fruitlessly trying to catch up on an endless and ever-expanding Netflix queue. And yet - I’m trying not to feel bad about it. It’s okay to take care of your life before you take care of your writing. It’s okay to take care of your children, your mental health, or whatever your responsibilities and obligations to yourself and others are. We both know that. Of course nobody is cracking a whip here, least of all you, gentle reader. At the same time, I do think that it’s beneficial to stretch those blogging muscles at least once a month, so I’ll try make more of an effort, or risk stagnation of what I consider a core skill of mine. It’s time to get those creative juices flowing - to go ahead and try - even if it hurts and the results are terrible. Just starting is the hard part. I can’t even tell you how many times I’ve tried to start writing a post then just given up in a fit of despair. Sounds dramatic, but then, how else do you describe a “fit of despair”? I’ll admit it - I haven’t been following the tech industry as zealously as I used to. Scanning through every tech headline in the news has only led to a vague sense of listlessness, followed by disappointment, and ending with boredom. That hunger for “the next big thing” can’t really be satisfied by snacking on my RSS feed. Deep dives into emerging tech are more satisfying, but I don’t really have the time to read Wired Magazine from cover to cover anymore. Look, I’m not about to go on one of those tech detox programs where you whine about smartphone addiction and proselytize over the benefits of a tech-free life from your surfboard. But there’s only so long I can think about the notch, especially now that they are popping up on Android phones as well (get back to me when there are no more notches on any more phones, and we’ll talk). There’s only so long I can shake my head at Facebook as they sell our online identities to nefarious third parties on one day, then announce a goddamn dating service on the next. There’s only so long I can listen to Elon Musk prattle on about going to Mars while failing to deliver on the Model 3. In short, there isn’t a lot to be enthusiastic about in 2018 so far. But then Sundar Pichai stood on up on the amphitheatre stage at a Google I/O and blew my mind. Victor had sworn to himself that he wasn’t going to watch her again. But he couldn’t bear to sit in that soulless hotel room for one more night, agonizing over the life that was stolen from him. So here he sits, on a bench across the street from the house he knows so well, watching his wife kiss another man - a stranger he’s never seen before. After their embrace ends, they clink their wine glasses and toast to some special event. Their anniversary perhaps? Marcy looks stunning in a black dress he’s never seen before, her hair done up on the top of her head. Now in her fifties, she’s always looked beautiful to him, but something was different about her. She looked healthier, more trim, and more relaxed than he’d ever seen her. His jealousy welled up in him and threatened to choke him in a hot, simmering wave. Was she happier with this other man than she was ever with him? A decade ago, there was a naïve delight in posting on Facebook or Twitter. Social media hadn’t yet evolved into the complex, anxiety-producing system of social currency it is today. Status updates were simply that - status updates. There was no pressure to be culturally savvy or sarcastic or applause-worthy. You could be authentic, sincere, or boring if you wanted to because it all started out as a friendly little experiment. In the beginning, there were no “likes”. Can you even imagine social media without a heart or a thumbs up moderating every online interaction? So, when I came across this article about Mastodon on the Outline, I was intrigued. I’d forgotten that microblogging used to be fun. I’d also totally forgotten about Mastodon, which arrived on the scene in 2016 and seemed as doomed to fail as app.net or ello. But how could you not feel the nostalgic, warm-and-fuzzy appeal of “a nicer version of Twitter” that “makes the internet feel like home again”? And sometimes open-source initiatives in the decentralized web can flourish - just look at where Bitcoin is going these days. Unfortunately, although the people who hang out in Mastodon instances seem just lovely (depending on the instance), the Mastodon front-end user interface is just horrible. The chemistry lecture was so boring I wanted to drop my head onto my desk and pass out. Even surreptitiously browsing through Twitter (as the rest of the class was doing apparently) held no appeal. I needed a Starbucks or something, anything to keep me awake. The professor droned on about the spectroscopic properties of carbon compounds. Properties I could have rattled off when I was in kindergarten. This stuff was so easy. It’s not easy being smart. As a young kid burdened with a ridiculously high IQ, I quickly learned to downplay my intelligence or face ostracism on the playground. In high school, I quietly drifted through the system, keeping my mouth shut in class rather than being labelled as the teacher’s pet. I got in a lot of trouble for daydreaming. The teachers never caught on that while I was doodling in my notebook and drawing pictures of unicorns and spaceships, I was soaking in every word the teachers said. Now I’m in college and I’m finally free to embrace my inner geek. Unfortunately, the middle-of-nowhere small town where I live, Mountain Valley, isn’t exactly a magnet for intellectual types. The professor started talking about an experiment I was familiar with, and writing out some equations on the whiteboard. But he was getting it all wrong. Nails on a chalkboard would be less painful than watching the professor painstakingly write out the wrong equations. I couldn’t help myself - I raised my hand. I’ve been looking back at the past year and chastising myself for only writing half as many posts as I’d hoped. So, I’m going to mix it up a bit and write more fiction on this blog. I’ll start with a serialized short story with the modest goal of one “chapter” per post with no set schedule and see how it goes. I’ll intersperse these fictional interludes with other posts as well, so I’m not going all-in on the fiction thing. I should warn prospective readers that any fiction on this site is probably rated R so you can expect some coarse language at the very least. Also, this is all very rough and experimental and unedited, so don’t take this as a finished piece of work - it’s just for fun. For fun, but not a necessarily a “fun” writing style because my writing tends to get really dark really quickly. I should probably work on that. As you may know, I have a thing for time travel. So, the first story I’m starting with could be considered Back to the Future fan fiction of sorts. None of the characters from this movie appear here, but I’ve shamefully ripped off the plot from Back to the Future 2. The genesis for this story lies in this YouTube video where Biff Tannen is replaced with Donald Trump with such eerie seamlessness. I’ve since learned, by the way, that the Back to the Future 2 writers intentionally based Biff’s character on Trump. Obviously, the darkest timeline meme has also contributed to the thought process behind this story. And a weird dream, which I won’t go into. In the Back to the Future films, Marty McFly jumps back in time 30 years from 1985 to 1955 and also 30 years forward in time from 1985 to 2015. I thought it would be fun for a protagonist in 2015 to jump back in time to 1985 to experience all the amusingly anachronistic quirks of another era. It’s funny, and more than a little disturbing, to think of the 80s as another era because I lived through that time. Anyway, this preamble is now longer than part one of my story, so I’d best begin. My iPhone 6S shows no signs of aging, so I’m not looking to upgrade any time soon. But even if I was, the iPhone X is not a phone I would buy. Not because it is a terrible product - the reviews have been borderline sycophantic. Nor because it is too radical - I would almost certainly pass over the iPhone 8 as being too similar to the 6S to justify an upgrade. Not even the high price phases me, which most reviewers cite as the main drawback of the X. After paying $1200 for my last iPhone (to upgrade the piss-poor entry-level memory from 16GB to 64GB), an extra $200 doesn’t seem that hard to swallow. And no, I have no compelling reason to switch back to Android at this point. The reason I wouldn’t buy this phone is that it may be “the future of the smartphone”, but it is not “the smartphone of the future.” It is a precursor to perfection. A signpost pointing to greatness a few years from now. And I thank all those who bought it for alpha testing my future phone. Here are my thoughts. Let’s start with the hardware design, which is most important because, unlike software, it cannot change in this iteration of the device. Google Home is Canada’s first official smart speaker, so I couldn’t resist pre-ordering one when it landed in the True North. Being an early adopter is definitely out of character for me - I think this is the first product I’ve ever pre-ordered. Anyway, I’ve been using it for a few months now. Here are my thoughts so far. The main draw of the Google Home is the ability to converse with the Google Assistant. Ambient computing, as it is called by some, is a cool sci-fi concept and, along with the flip phone and the tablet, is another Star Trek crossover from fantasy into reality. A lots of geeks out there love the idea of leaning back in their captain’s chair with a cup of Earl Grey and barking out “computer!” to chat with an AI. The problem is, in real life, you aren’t running a starship. And to run your household seamlessly through voice control, the Internet of Things (IoT) needs to catch up to the future. Right now it is a tangled mess of incompatible competing platforms. A case in point - Siri doesn’t seem to have a problem controlling my Philips Hue smart bulbs, but Google does. The Google Assistant cheerily assures me the lights are off, but they stubbornly stay on, proving that even an artificial intelligence can lie. Although I deal more in words than aesthetics, I have a deep appreciation of design - especially architectural, industrial, and UI design. I have an extra appreciation for a fully-realized and well-documented design language. When I was tasked to design a user interface, for example, I found that Google’s documentation for their Material Design to be an invaluable resource. I recently upgraded to Windows 10 on my work machine and I am enjoying the fresh coat of “Metro” paint. 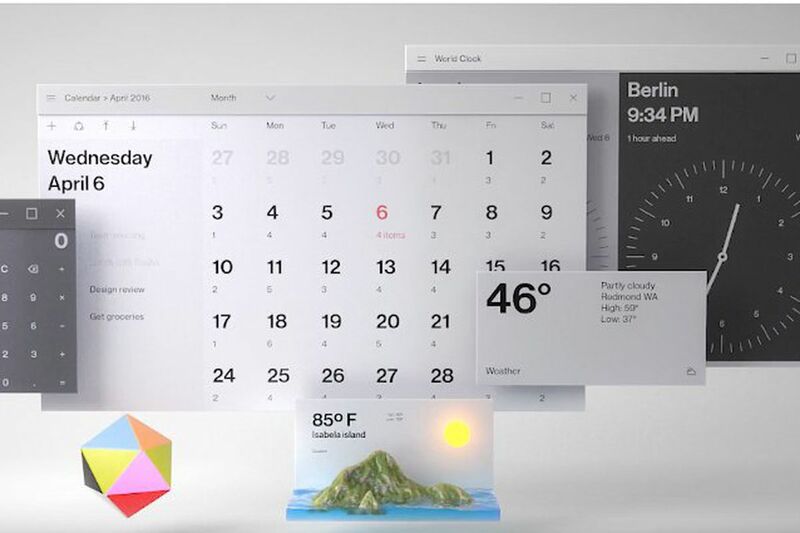 But I have to say that Microsoft’s newly-announced Fluent Design feels far more like the future. And I mean that literally, because the future of computing may very well take place in augmented reality, or mixed reality as some now prefer to call it. If there is a counterpoint to the so-called ambient computing environment (presided over by virtual assistants such as the Amazon Echo’s Alexa), then this is it. Or maybe we are moving toward a fusion of these two UI paradigms? Fluent Design is clearly an attempt to establish some design fundamentals in a 3D environment. But, there is also a sparse Desktop concept floating out there that looks amazing. I’m looking forward to a more defined design language as Fluent Design moves out of the concept and into the implementation phase. Having said that, is it time for the pendulum to swing away from the clean, minimalist trend of the past decade and back toward colour and chaos?